French electro band M83 has teamed up with Converse for a contest that will give fans an opportunity to design official M83 posters that will be featured at Central Park Summerstage in August and sold for charity. French electro band M83 has teamed up with Converse for a contest that will give fans an opportunity to design official M83 posters that will be featured at Central Park Summerstage in August and sold for charity. Original artwork, along with a sentence or two writeup, should be sent to M83Contest@Converse.com. Submissions can also be submitted through Instagram with hashtag #M83Converse. The deadline is Friday, July 27. Up to three winners will be selected, each having their artwork appear on original posters. 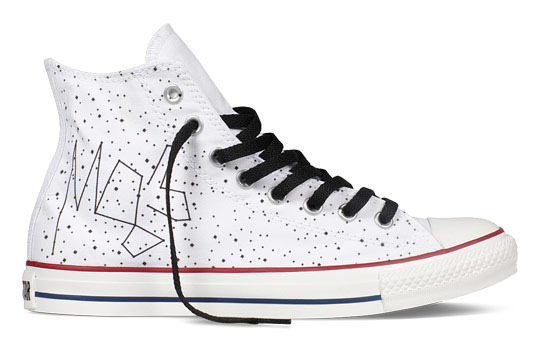 Additionally, they'll receive the custom M83 x Converse Chuck Taylor All Star sneakers pictured above. Visit Converse.com/M83 for more information and entry rules.